Ares is a state-of-the-art weapons management system that utilizes an intuitive graphics based user interface. 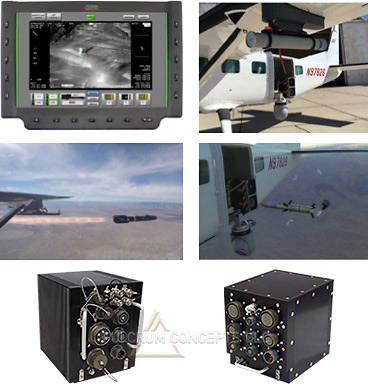 The system is fully integrated with L3-Wescam Gen II sensors. Ares currently supports Griffin®, Hellfire, 2.75″ Rockets, GAU-19, M-134, and M-134 Gun Pods. The system can control Hellfire missiles directly, which enables customers to save significant weight by eliminating smart launchers in light attack configurations. The user interface displays targeting symbology over live video. EO/IR functions can also be controlled through the Ares interface. Ares enables the customer to remain focused on the fight, not on the system. The Ares system consists of four components: Weapons Management Unit (WMU), Weapons Expansion Module (WXM), Stores Management Panel (SMP), and a Multifunction Display (MFD). The WMU performs video processing, EO/IR integration, MFD integration, and discrete functional control. The WXM performs all weapons communication functions. The SMP provides a hard Armed-Safe switch as well as weight-on-wheels, and jettison functions. The MFD provides a touchscreen user interface and EO/IR video display. Ares also integrates with Tek Fusion Global Inc’s Pathfinder® Mission Management System. Together the two systems provide an enhanced tactical cockpit solution. Ares is Tek Fusion Global and Fulcrum Concepts joint endeavor. 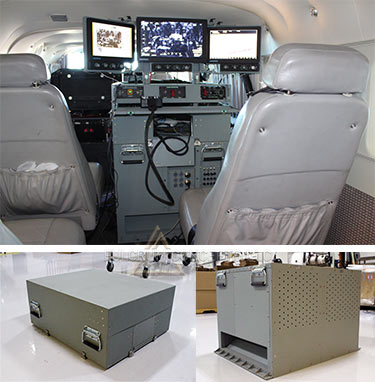 The Battlestation is a modular roll-on-roll-off operator workstation configured for Armed ISR operations. The system consists of two primary modules that can easily be positioned on an aircraft, stacked, and secured to seat rails or cargo rings. When not in use the system closes up and protective panels easily attach to protect the system during transport. The Battlestation can be ordered with Ares Weapons Management System, Pathfinder Mission Management System, INS/GPS, and EO/IR components pre-installed. A fully populated system only requires aircraft power and a GPS antenna feed.